The Banqiao Reservoir Dam (simplified Chinese: 板桥水库大坝; traditional Chinese: 板橋水庫大壩; pinyin: Bǎnqiáo Shuǐkù Dàbà) is a dam on the River Ru in Zhumadian City, Henan province, China. Its failure in 1975 caused as many as 230,000 deaths. The dam was subsequently rebuilt. 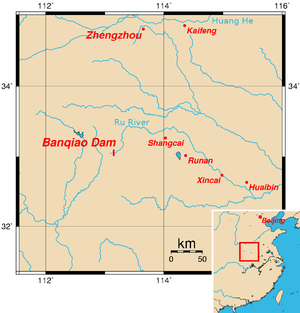 The Banqiao dam and Shimantan Reservoir Dam (simplified Chinese: 石漫滩水库大坝; traditional Chinese: 石漫灘水庫大壩; pinyin: Shímàntān Shuǐkù Dàbà) are among 62 dams in Zhumadian that failed catastrophically or were intentionally destroyed in 1975 during Typhoon Nina. Construction of the Banqiao dam began in April 1951 on the Ru River with the help of Soviet consultants as part of a project to control flooding and provide electrical power generation. The construction was a response to severe flooding in the Huai River Basin in 1949 and 1950. The dam was completed in June 1952. Because of the absence of hydrology data, the design standard was lower than usual. After the 1954 Huai River great flood, the upstream reservoirs including Banqiao were extended, constructed, and consolidated. Banqiao Dam was increased in height by three meters. The dam crest level was 116.34 meters above sea level and the crest level of the wave protection wall was 117.64 meters above sea level. The total capacity of the reservoir was 492 million m3 (398,000 acre feet), with 375 million m3 (304,000 acre feet) reserved for flood storage. The dam was made of clay and was 24.5 meters high. The maximum discharge of the reservoir was 1742 m3/s. Cracks in the dam and sluice gates appeared after completion due to construction and engineering errors. They were repaired with the advice from Soviet engineers and the new design, dubbed the iron dam, was considered unbreakable. Chen Xing (陈惺), one of China's foremost hydrologists, was involved in the design of the dam. He was also a vocal critic of the government's dam building policy, which involved many dams in the basin. He had recommended 12 sluice gates for the Banqiao Dam, but this was criticized as being too conservative, and the number was reduced to five. Other dams in the project, including the Shimantan Dam, had a similar reduction of safety features and Chen was removed from the project. In 1961, after problems with the water system were revealed, he was brought back to help. Chen continued to be an outspoken critic of the system and was again removed from the project. Officially, the dam failure was a natural as opposed to man-made disaster, with government sources placing an emphasis on the amount of rainfall as opposed to poor engineering and construction. The People's Daily has maintained that the dam was designed to survive a once-in-1000-years flood (300 mm of rainfall per day) but a once-in-2000-years flood occurred in August 1975, following the collision of Typhoon Nina and a cold front. The typhoon was blocked for two days before its direction ultimately changed from northeastward to westward. As a result of this near stationary thunderstorm system, more than a year's worth of rain fell within 24 hours (new records were set, at 189.5 mm (7.46 inches) rainfall per hour and 1060 mm (41.73 inches) per day, exceeding the average annual precipitation of about 800 mm (31.5 inches)), which weather forecasts failed to predict. China Central Television reported that the typhoon disappeared from radar as it degraded. According to Xinhua, the forecast was for rainfall of 100 mm by the Beijing-based Central Meteorological Observatory. Communication with the dam was largely lost due to failures. On August 6, a request to open the dam was rejected because of the existing flooding in downstream areas. On August 7 the request was accepted, but the telegrams failed to reach the dam. The sluice gates were not able to handle the overflow of water partially due to sedimentation blockage. On August 7 at 21:30, the People's Liberation Army Unit 34450 (by name the 2nd Artillery Division in residence at Queshan county), which was deployed on the Banqiao Dam, sent the first dam failure warning via telegraph. On August 8, at 01:00, water at the Banqiao crested at the 117.94 m level above sea level, or 0.3 meter higher than the wave protection wall on the dam, and it failed. The same storm caused the failure of 62 dams in total. The runoff of Banqiao Dam was 13,000 m3 per second in vs. 78,800 m3 per second out, and as a result 701 million m3 of water were released in 6 hours, while 1.67 billion m3 of water were released in 5.5 hours at an upriver Shimantan Dam, and 15.738 billion m3 of water were released in total. The resulting flood waters caused a wave 10 kilometers (6.2 mi) wide and 3–7 meters (9.8–23.0 ft) high in Suiping (遂平) that rushed onto the plains below at nearly 50 kilometers per hour (31 mph), almost wiping out an area 55 kilometers (34 mi) long and 15 kilometers (9.3 mi) wide, and creating temporary lakes as large as 12,000 square kilometers (4,600 sq mi). Seven county seats, Suiping, Xiping (西平), Ru'nan (汝南), Pingyu (平舆), Xincai (新蔡), Luohe (漯河), and Linquan (临泉) were inundated, as were thousands of square kilometers of countryside and countless communities. Evacuation orders had not been fully delivered due to weather conditions and poor communications. Telegraphs failed, signal flares fired by Unit 34450 were misunderstood, telephones were rare, and some messengers were caught by the flood. While only 827 out of 6,000 people died in the evacuated community of Shahedian just below Banqiao Dam, half of a total of 36,000 people died in the unevacuated Wencheng commune of Suipin County next to Shahedian, and the Daowencheng Commune was wiped from the map, killing all 9,600 citizens. Although a large number of people were reported as lost at first, many of them later returned home. A 2005 book compiled by the Archives Bureau of Suiping county reports that more than 230,000 were carried away by water, in which 18,869 died. It has been reported that 90,000 - 230,000 people were killed as a result of the dam breaking. To protect other dams from failure, several flood diversion areas were evacuated and inundated, and several dams were deliberately destroyed by air strikes to release water in desired directions. The Nihewa and Laowangpo flood diversion areas downstream of the dams soon exceeded their capacity and gave up part of their storage on August 8, forcing more flood diversion areas to begin to evacuate. The dikes on the Quan River collapsed in the evening of August 9, and the entire Linquan county in Fuyang, Anhui was inundated. As the Boshan Dam, with a capacity of 400 million m3, crested and the water released from the failures of Banqiao and Shimantan was rushing downstream, air strikes were made against several other dams to protect the Suya Lake dam, already holding 1.2 billion m3 of water. Suya Lake won only a temporary reprieve, as both it and Boshan became eventual targets. Finally, the Bantai Dam, holding 5.7 billion m3 of water, was bombed. The Jingguang Railway, a major artery from Beijing to Guangzhou, was cut for 18 days, as were other crucial communications lines. Although 42,618 People's Liberation Army troops were deployed for disaster relief, all communication to and from the cities was cut. Nine days later there were still over a million people trapped by the waters, who relied on airdrops of food and were unreachable by disaster relief workers. Epidemics and famine devastated the trapped survivors. The damage of the Zhumadian area was estimated to be about CN¥3.5 billion (US$513 million). The Zhumadian government appealed to the whole nation for help, and received more than CN¥300 million (US$44,000,000) in donations. After the flood, a summit of National Flood Prevention and Reservoir Security at Zhengzhou, Henan was held by the Department of Water Conservancy and Electricity, and a nationwide reservoir security examination was performed. Chen Xing was again brought back to the project. According to the Hydrology Department of Henan Province, approximately 26,000 people died in the province from flooding and another 145,000 died during subsequent epidemics and famine. In addition, about 5,960,000 buildings collapsed, and 11 million residents were affected. Unofficial estimates of the number of people killed by the disaster have run as high as 230,000 people. The death toll of this disaster was declassified in 2005. Within eleven years of the dam failure, the lower reach of the River Ru, esp. Zhumadian City, experienced several more disastrous floods. After many feasibility studies, the new Banqiao Reservoir reconstruction was listed as a key national project of The Seventh Five-Year Plan of China. The project owner was Huai River Water Resources Commission. The construction contractor was Changjiang Gezhouba Engineering Bureau. By the end of 1986, the rebuilding project commenced. On June 5, 1993, the project was certified by the Chinese government. The reconstructed Banqiao Reservoir controls a catchment area of 768 km2 (297 sq mi). The maximum reserve capacity is 675 million m3 (178 billion gallons), a capacity increase of 34% above the capacity of the failed dam. The effective storage is 256 million m3 (67.6 billion gallons) and the corresponding normal high water level is 111.5 m (366 ft) above sea level. The flood control storage is 457 million m3 (121 billion gallons). The dam is made of clay and is 3,720 m (12,200 ft) long and 50.5 m (166 ft) high. The dam crest level is 120 m (390 ft) above sea level. The maximum discharge of the reservoir is 15000 m3/s (about 3.96 million gallons/s). After the disaster of the Banqiao dam failure, the Chinese government became very focused on surveillance, repair, and consolidation of reservoir dams. China has 87,000 reservoirs across the country; most of which were built in the 1950s–1970s using low construction standards. Most of these reservoirs are in serious disrepair, posing challenges to the prevention and control of flood-triggered geological disasters in areas with a population of 130 million or more. China's medium and small rivers are considered to be the Achilles' heel in the country's river control systems. According to a report from 2010, by the Ministry of Water Resources, China has invested CN¥64.9 billion (US$9.72 billion) since the 1998 Yangtze River floods in repairing and consolidating the country's 9,197 degraded reservoirs, of which 2,397 are large or medium-sized, and 6,800 are key small reservoirs. ^ Human Rights Watch (1995). The Three Gorges Dam in China: forced resettlement, suppression of dissent and labor rights concerns (Report) (Human Rights Watch/Asia Vol. 7, No. 1 ed.). New York: Human Rights Watch. Retrieved 18 February 2019. ^ Thayer Watkins. "The Catastrophic Dam Failures in China in August 1975". San Jose State University. Retrieved 2013-11-25. ^ Ding Yihui (1994). Monsoons over China. Dordrecht: Kluwer Academic Publishers. p. 229. ISBN 0792317572. ^ a b c d e f Xinhua News Agency (2005-10-01). "After 30 years, secrets, lessons of China's worst dams burst accident surface". People's Daily. Retrieved 2019-02-18. ^ a b "History". CCTV. Retrieved 2013-11-25. ^ Yi Si. "The World's Most Catastrophic Dam Failures: The August 1975 Collapse of the Banqiao and Shimantan Dams". In Qing, Dai (ed.). The river dragon has come! The Three Gorges Dam and the fate of China's Yangtze River and its people (PDF). Armonk, NY: M.E. Sharpe. pp. 25–38. ISBN 9780765602053. Retrieved 18 February 2019. ^ Jiang, Hua (2010-08-11). "Warning". Southern Metropolis Daily (in Chinese). p. AT08. Archived from the original on 9 August 2012. Retrieved 21 April 2013. ^ "CCTV.com". Cctv.cn. Retrieved 2013-11-25. ^ 水旱灾害 (in Chinese). Hydrology Department of Henan. 2002-10-08. Retrieved 20 April 2013.